Bell is best known for two things: corruption of its municipal leadership, and La Casita Mexicana. 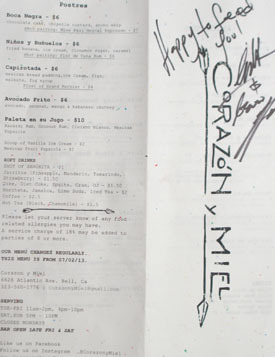 However, it can add a third item to that list with the opening of Corazon y Miel ("heart and honey"), which undoubtedly represents another step towards the City's culinary legitimacy. 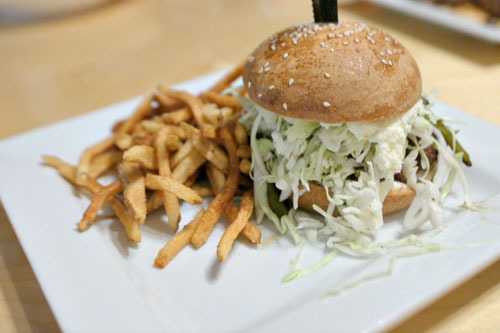 The restaurant is the work of Salvadoran-American chef Eduardo Ruiz, Travis Hoffacker, and managing partner Robin Chopra. 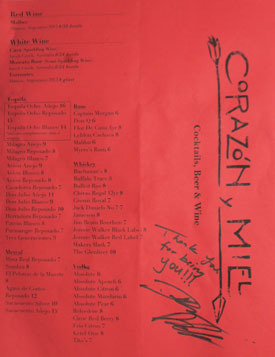 Ruiz cooked for two years at Jon Shook and Vinny Dotolo's seminal Animal, and also worked a stint at Diego Hernandez's Corazón de Tierra in Baja. In 2011, he formed catering company Whim Kitchen with Chopra. The two LA natives were actually childhood friends, and reconnected once Ruiz started culinary school in Pasadena, realizing that they both shared a passion for food. Whim started off hosting underground dinners in a series called "Under the Table," and soon their catering business began to take off as well. As such, they took over Corazon y Miel's space, intending to use it to expand Whim, but eventually decided to turn the building into a restaurant, bringing on board Cali Banh Mi's Hoffacker, a friend of theirs, in the process. 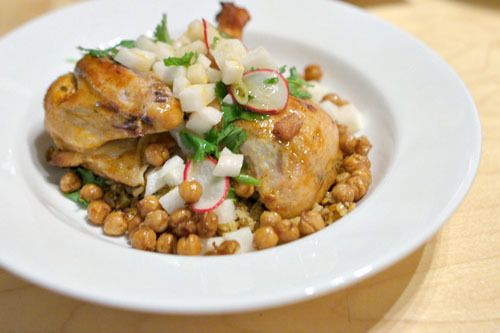 The much-needed restaurant debuted on March 2nd this year. 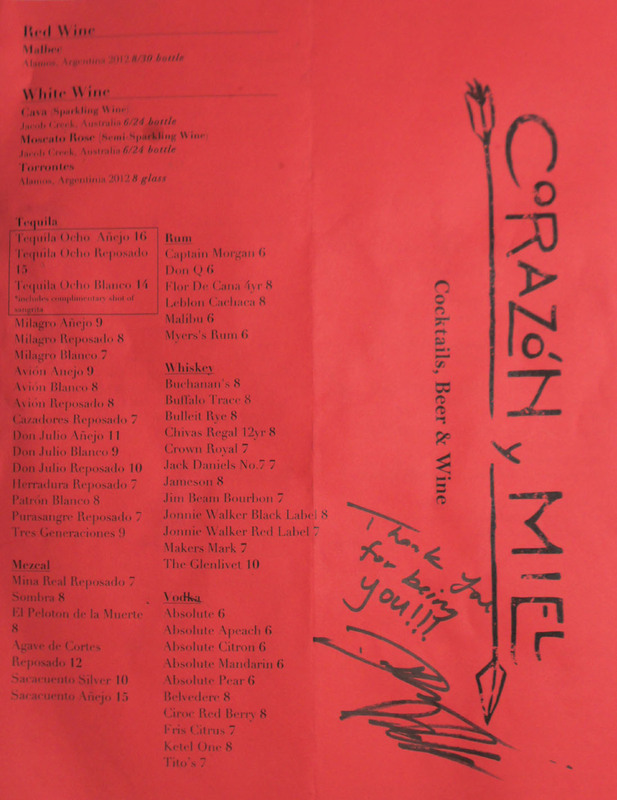 Corazon y Miel occupies the site once home to a cocktail lounge, a fairly intimate space with perhaps room for 50 diners. A bar dominates one side of the structure, while tables line the other. There are also three small booths at the front, as well as a private room in the back that I'm not sure is being used for anything at this point. Votiva Margarita [$10.00] | Our house Margarita served in a traditional Mexican candle glass, Cherry "Wick"
Speaking of those three booths, we took a seat at one of them and ordered up some cocktails as we waited for our table to get ready. 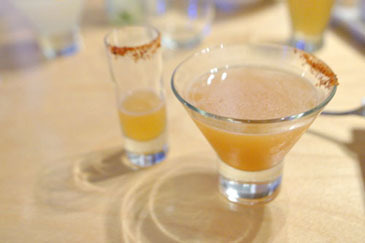 First was the restaurant's signature Votiva Margarita, a beautiful rendition of the classic drink with its balance of tartness and sweet spice. The Platoon of Death, meanwhile, was much more in-your-face, a thick, viscous shot that gave up intense blasts of sour, spicy, smoky, and salty flavors, all leading to a boozy burn on the finish. 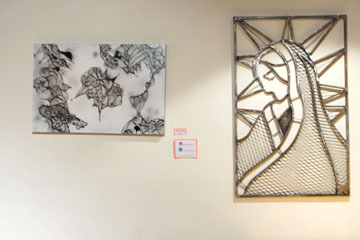 We also took the opportunity to examine some of the original artwork on display, much of which is available for purchase, at very reasonable prices I might add. 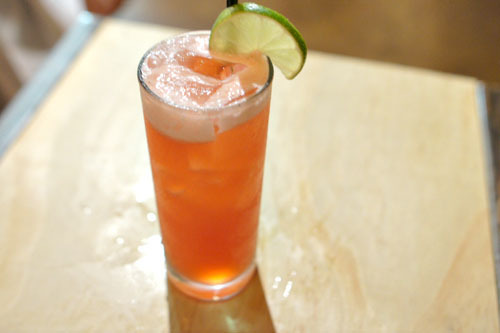 The Salva-Rita was an ostensibly Salvadoran riff on the margarita, and had its own charms as well, a very balanced, well-integrated cocktail with a pleasing backbone of mezcal. The Buho Rojo was similarly delicious, with loads of pineapple on the attack leading to a remarkably sweet, floral spice that made it quite easy drinking. 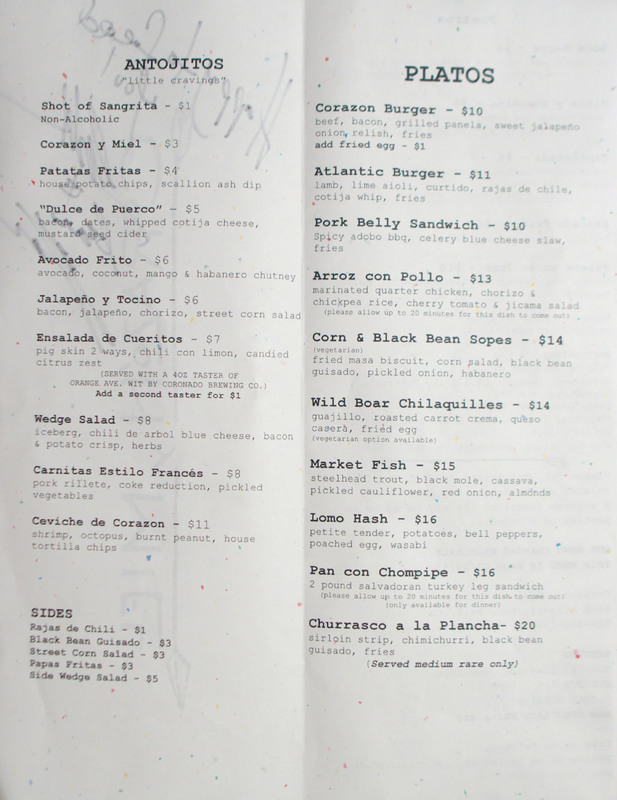 Corazon y Miel's menu has expanded in both scope and price since opening, and features Chef Ruiz's updated takes on pan-Latin classics; some have even likened the food to a Latino version of Animal. 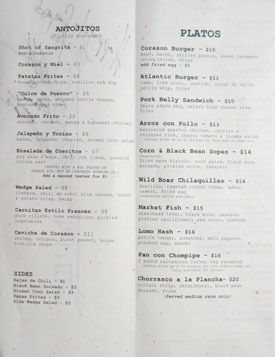 We went for the "Fire the Menu" option, which allows diners to sample everything on the menu for $175, a substantial discount compared to ordering each item individually. 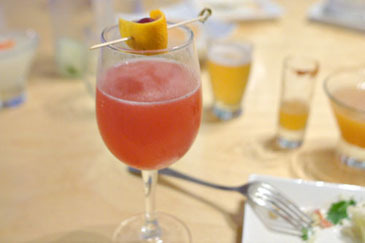 To drink, cocktails (and there are a lot of 'em) are a must here. The restaurant opened with Christian Pulido behind the bar, but I believe he's gone, replaced by the capable Darwin Manahan. 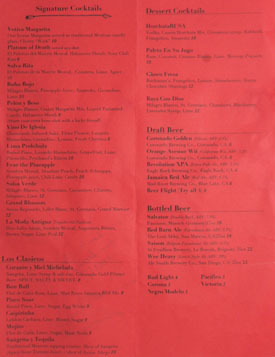 There's also a smattering of surprisingly interesting beers available, and even a couple wines, if you insist. Click for larger versions. 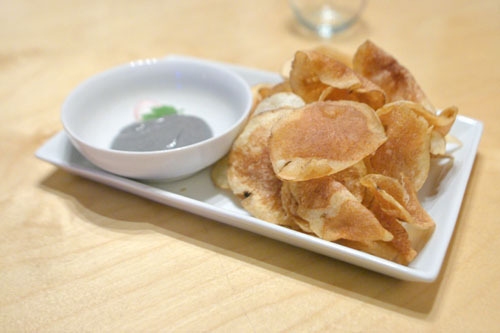 Housemade potato chips were spot on: salty, crunchy slivers of patata goodness that I could easily munch on alone. However, that scallion ash condiment was uh-mazing, a smoky, deeply-flavored, and beautifully-tinted dip that had me wanting more. 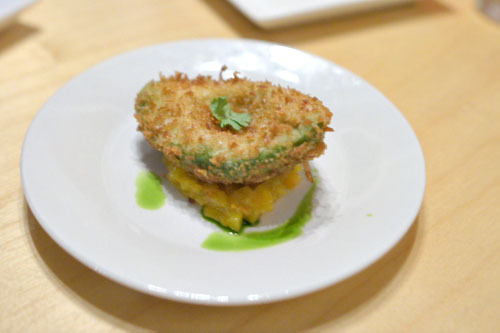 The fried avocado was a fun little dish. The hero here was clearly the aguacate, its lush, creamy character on display, joined by a fantastically crisp, savory, coco-crust and hints of sweetness from the chutney. Interestingly enough, this item also appears, unchanged, on the dessert menu. 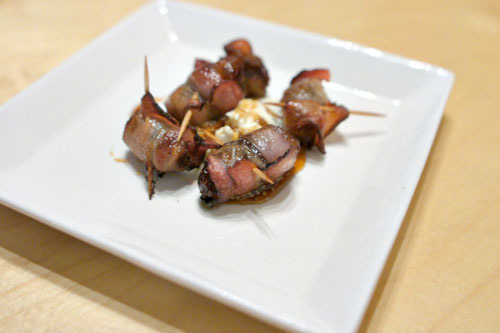 Here was an updated version of the ubiquitous dish of bacon-wrapped dates, a Latin-ized version of Suzanne Goin's famed preparation if you will. The classic interplay between salty and sweet was well represented here, accented by a delightful touch of char and the creamy weight of the cotija. 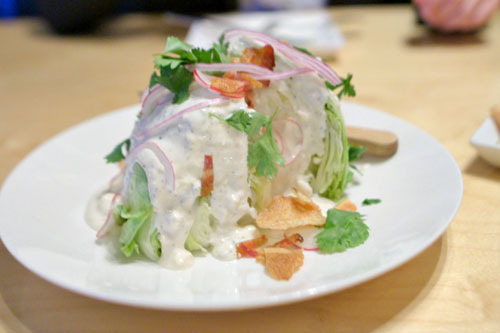 Ruiz's riff on the classic wedge salad was certainly commendable as well, with the crisp, juicy shards of lettuce melding gorgeously with the zesty, piquant dressing, all while the crispy bits added lovely pinpoints of saltiness to the fray. 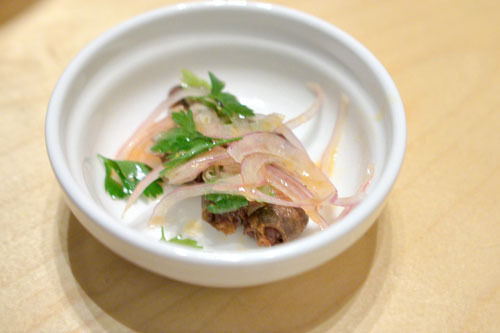 Corazon y Miel's namesake dish did not disappoint, coming out as a tiny bowl of chicken hearts, mixed in with a honeyed dressing, cilantro, and red onion. 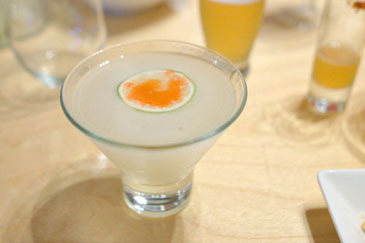 The corazones showed off a satisfying bite, with a lingering, earthy savoriness to them that was keenly tempered by the tang and sweetness of its accoutrements. 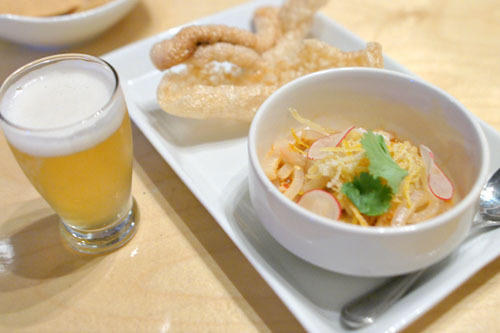 The ceviche was universally praised at the table, and with good reason. The combo of shrimp and octopus was on point: tender, yet with a good bite, a perfect match for the bright flavors at play and the slight undercurrent of heat in the dish. 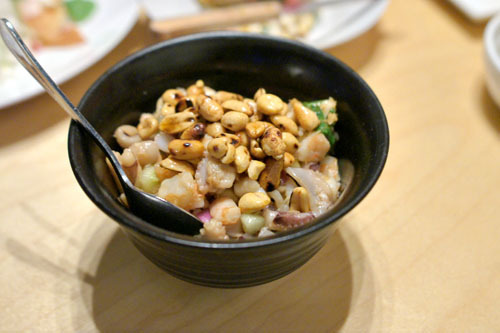 What took this over the top, though, was the use of peanut as cancha, which added a marvelous, smoky, nutty component to the course. 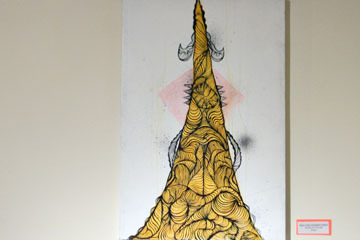 Fantastic textures on this one, too. 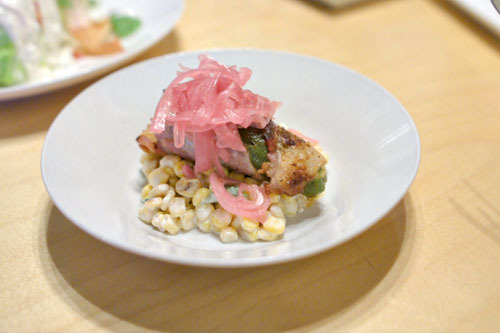 In this oft-referenced "homage to street food," a singular jalapeño is stuffed with chorizo, wrapped in bacon, and placed atop a mound of corn. 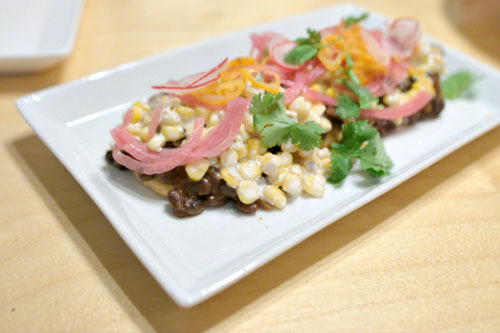 It's about as tasty as it sounds, a mélange of salty and spicy flavors moderated by the creamy sweetness of elote, all with the red onion on top adding a bit zing to the mix. Yum. Here we had a duet of pork rind. 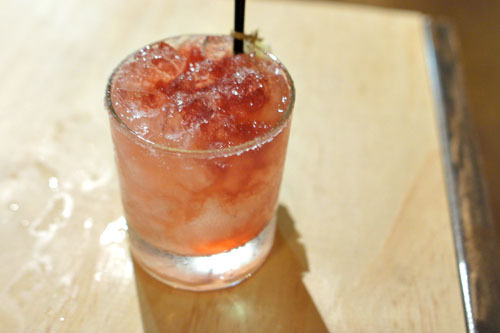 The first was the cueritos, in which the pig skin is pickled, resulting in a slick, snappy, jellied consistency. It was actually restrained in its porkiness, with a pretty delicate flavor on its own that worked well with the sharply citric, spicy notes in the dish. 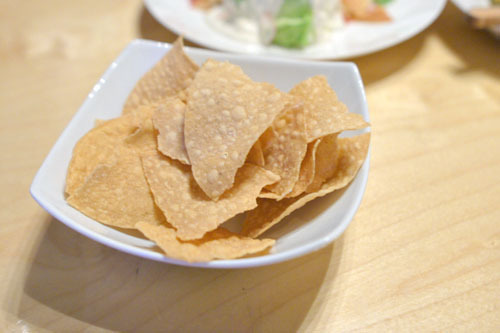 We also had some classic chicharrones, crunchy, salty, and oh-so satisfying, perfect for scooping up the cueritos. Along with the course came a small taster of Coronado Brewing's Orange Avenue Wit, which ended up pairing perfectly with the pork, its bright, spicy, citrus-y flavors working hand-in-hand with the dish. Ruiz's version of pork rillettes was uncommonly tender (and quite uncommon, overall), yet expectedly porcine. The Coke reduction here was fortunately restrained in its sweetness, but the key was the pickled veggies, which added a countervailing crunch and tartness to the dish that really balanced things out. More cocktails. The Pelón y Beso conveyed a sour, puckering quality to it, joined by a sweet spice from the tamarind and a finish redolent of habanero. It even comes with an extra shot (beso) to share. Next was the Vino De Iglesia, my favorite of the trio with its soft, smooth nuances and deft mix of sweet, fruity, and floral flavors. The Lima Prohibida, finally, conveyed a sharp, tart, citric base with undertones of booze, tempered by just a whisper of piloncillo sugariness. 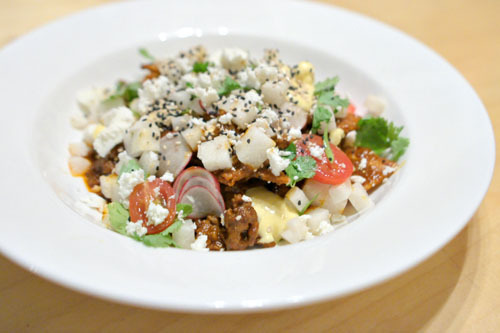 Corazon y Miel's take on chilaquiles was quite to my liking. I loved the sheer mix of different tastes and textures here, but with the spicy, savory, deeply-flavored boar remaining the clear star of the dish. There's lots going on here, but it all comes together cohesively (and deliciously). 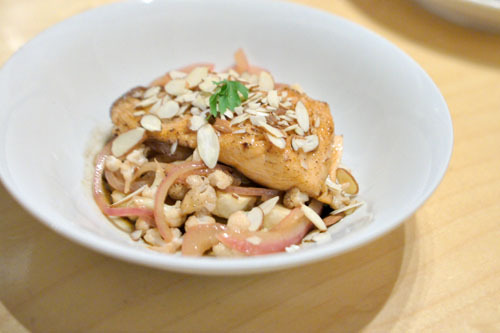 Steelhead arrived flaky, juicy, and super buttery, with a hearty, mole-kissed flair to it that went superbly with the starchy cassava, all while the cauliflower and onion added a great counterbalancing acidity to things. Sopes were classic in essence, as well as delicious. The thick, hefty masa formed a substantial base to the dish, on top of which the corn and black bean really worked together, making for a straightforward, satisfying combination perked up by the kick of habanero and onion. Chicken came out tender, juicy, and with a good depth of flavor to it. Even more interesting, though, was the arroz, which had a nutty, sweet, earthy character that, when paired with the jicama, made for a really interesting, multifaceted compliment to the bird. The most expensive item on the menu is actually worth a try. The steak wasn't the most tender, but was positively teeming with succulent, beefy goodness. 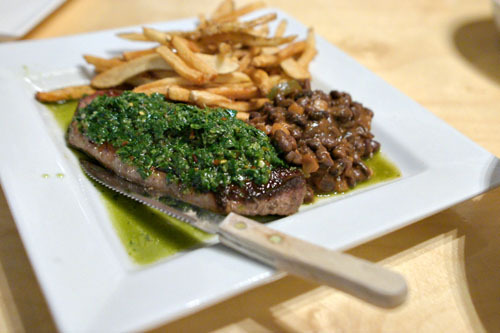 It was certainly enjoyable alone, but the accompanying chimichurri was simply marvelous, adding a bevy of bright, tangy notes to the dish that really paired perfectly with the heady flavors of the meat. The stewed black beans and fries on the side weren't anything to sneeze at, either. 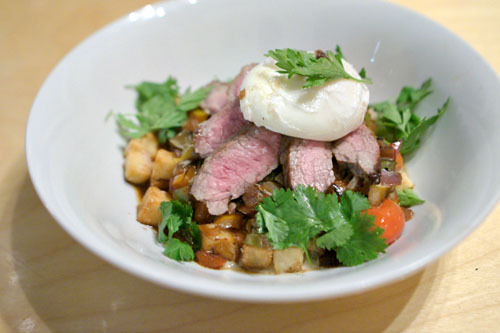 Ruiz's tenderloin hash was certainly one of my favorites of the night. The meat itself was pretty much spot on--juicy, tender, and with a pretty remarkable lushness for lomo. The combination of potatoes and peppers just made absolute sense with the meat, and I loved the overarching lushness of that egg, too. Didn't really get much wasabi, though. 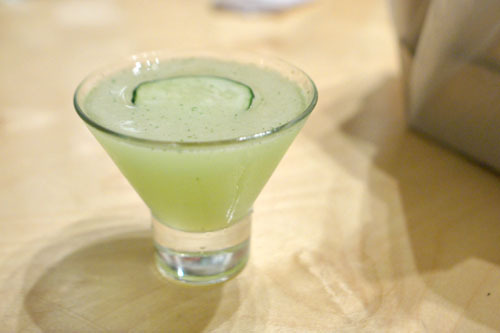 The Salsa Verde, unsurprisingly, tasted like salsa verde, but one with a distinct sweet-sour component to it, livened up by an overarching cucumber presence. One of my dining companions also ordered a Mojito, my old standby. 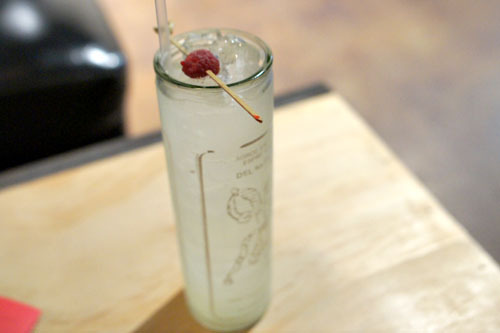 It was a classic interpretation of the drink, pretty much flawless, with a particularly appealing minty quality to it. 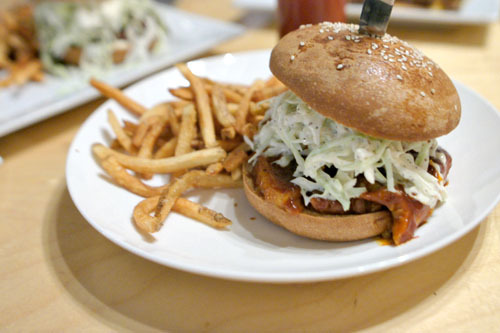 At this point, we moved on to the meat-between-bread portion of the menu, and first to act was this BBQ pork sandwich. The belly itself was meltingly tender, with a marked spicy sweetness to it, though it veered overly sugary for me, especially when taken with the sweet-ish roll. Fortunately though, the celery slaw made short work of the dish's heftiness, cutting through it all with aplomb. More to my liking was the Atlantic, which really showcased the earthy, heady savor of lamb. Indeed, the patty's ovine flavors were proudly conveyed here, only slightly tempered by the mount of veggies and cotija on top. 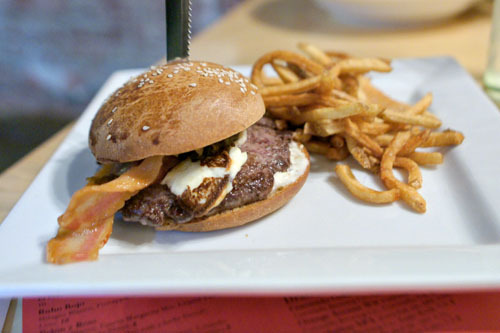 Corazon y Miel's signature burger wasn't much to look at, but the flavors were definitely there. The beef was clearly the hero, coming out immensely juicy and brimming with mouth-watering meaty goodness. I appreciated the masterful application of panela here, and the salty, crunchy bacon worked wonders, too. 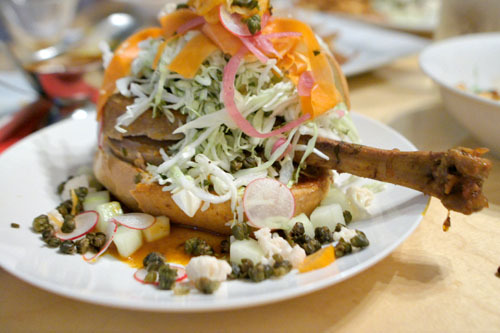 The menu's most visually-arresting piece is likely this slow-cooked turkey leg, inspired by Ruiz's grandmother. The meat was literally falling-off-the-bone tender, with a deep, salty, profound savor to it that was expertly balanced by the mounds of crisp, bright veggies piled atop, all while the accompanying roll remained pretty much useless. On to the desserts now. 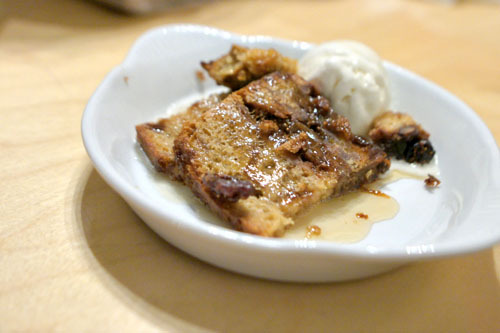 Ruiz's version of the traditional capirotada was something to behold, a sweet, sticky, uncompromisingly figgy bread pudding that was all that I'd hoped it would be. 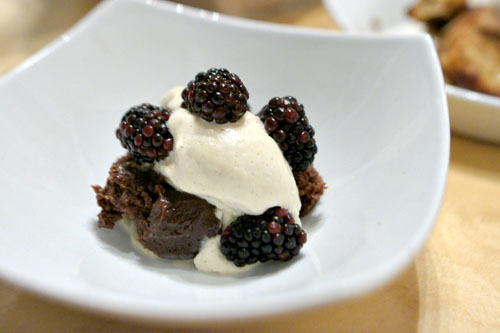 The "black mouth" will appeal to chocolate lovers, the cake coming out dense and rich, with a smart savory component from the use of chilies, all while the blackberries added a tinge of fruity tartness to the mix. My favorite of the desserts was this fantastic preparation of fried banana. The banana was beautifully presented, wonderfully fruity, and encased in a crisp, sugary wrapper just loaded with cinnamon-y spice. If that wasn't enough, the vanilla ice cream formed a perfectly cool counter to the banana that took the dish over the top. A must try. 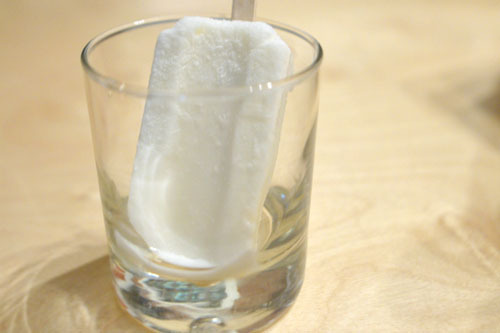 We closed with one of CyM's popsicles, this one rendered in coconut. It displayed a very focused, true-to-life sweetness, replete with coconut flakes in the popsicle itself and a fizzy, almost Pop Rocks-esque sensation in the mouth. 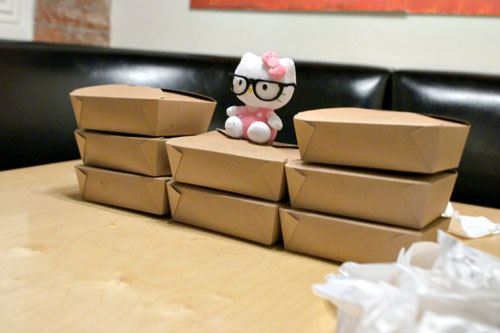 Lots of leftovers: the result of attempting the "Fire the Menu" with a team of four not-so-prepared eaters. 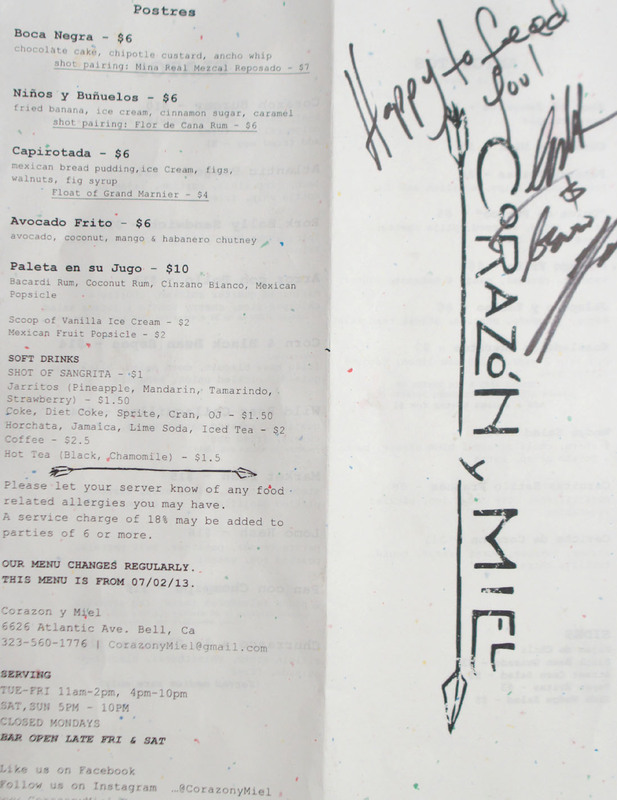 Corazon y Miel just might be the most ambitious restaurant to open in Bell in, well, ever. 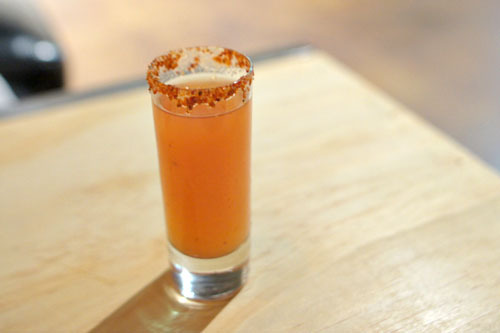 I was quite a fan of how Ruiz was able to take his unmistakably Latin flavors and translate them to a more contemporary aesthetic, sort of melding the types of food he grew up with the of-the-moment style of cooking that's all the rage these days. 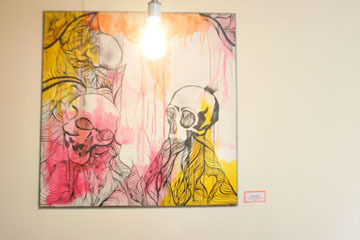 It's an intriguing, curious take on the cuisine that manages to be fun, yet serious and substantial at the same time. Finally, another reason to make the schlep down to Bell! 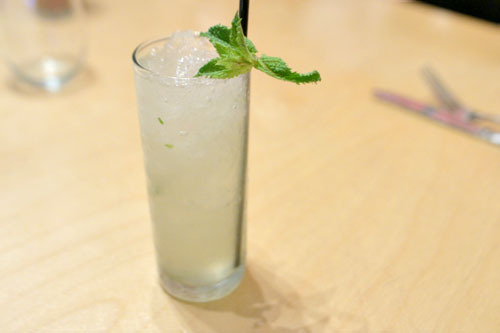 "YOU KNOW WHERE YOU AT, YOU IN BELL GARDENS FOO"
did they have a latin take on a mojito to start with? Is it $175 per person? Just ate here last night. How did this end up on Jonathon Gold's 101. It is like a frat house run establishment, competing with professional operations thoughout the city. They charge $3 valet just to move my car forward 20 feet to the parking lot. It took 15 minutes to get my first drink. 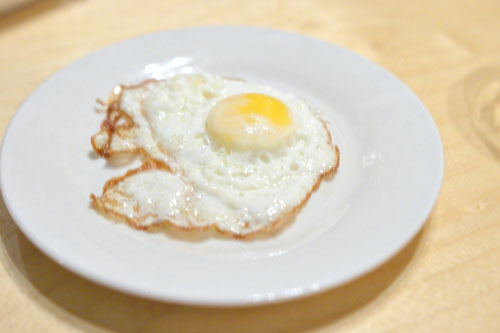 The dishes are amateurish at best. No chips and salsa, but you can get potato chips and a "ranch" dip. 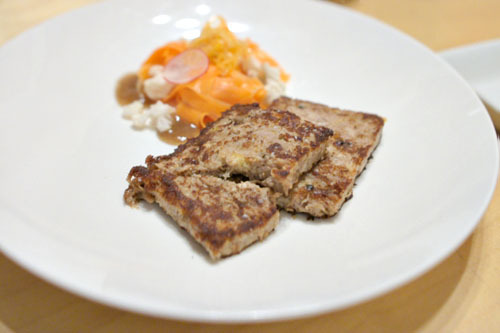 The foie gras tasted like dog food and the accompanying toast came out 5 minutes later. The dates were ok, as were the chilaquiles. The queso fundido had strips of meat in it as opposed to be being ground, it just didn't work. Best dish and I use the word loosely was the Argentinian Beef. My wife found some glasses in the restroom and gave them to a server and the chef yelled at the server for not paying attention to him. The chef should compose himself. He is clearly in over his head and should go back to being a sous chef. My second drink took 20 minutes to arrive, ordered before entrees and arrived just before I paid the bill. 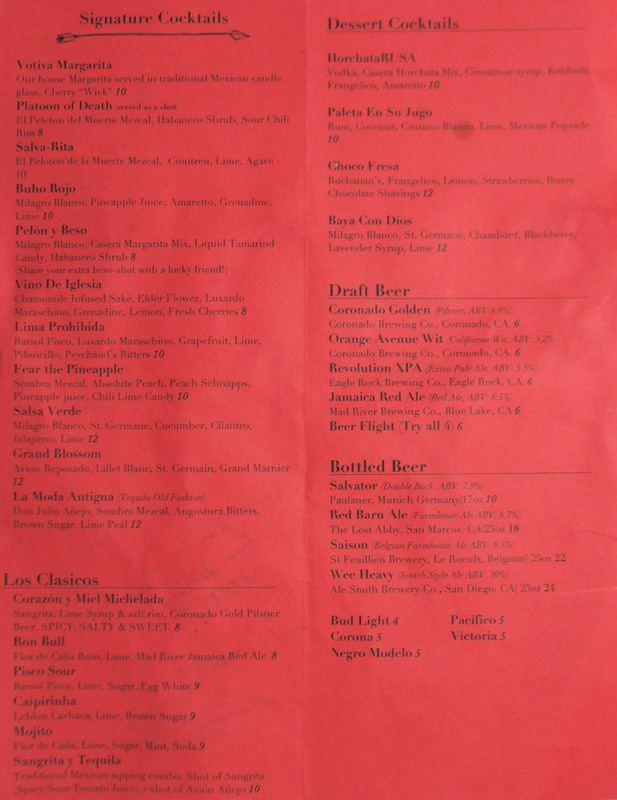 Much rather eat at Guelagetza or El Tepeyac or any of 40 gastrobars in LA. Shame on Jonathon Gold for recommending this place, it would not make my 1001 list.